Adding to CNN’s Sizeable Dossier of Misreporting on the TWA Flight 800 Crash With stunning regularity, CNN’s reporters and producers have, for the last twenty years, egregiously misreported on the evidence and eyewitness accounts pertaining to TWA Flight 800. More recent crashes, this time Metrojet’s demise, are regularly seized upon to craft news packages in which the TWA Flight 800 crash is mentioned at length. These mentions consist of repeating the same “official source” false narrative that CNN and other major news outlets have been promulgating for years, even though the public is now well aware that at least half a dozen key members of the official Flight 800 crash investigation have presented evidence showing that the official probable cause of the crash is untenable and that the physical evidence indicates that explosive ordnance caused Flight 800’s demise. CNN correspondent Randi Kaye presents and narrates the news package. Its most striking feature is that the Metrojet crash is barely mentioned. One could easily get the impression that the story is really about reinforcing in the minds of CNN’s viewers the details of the officially approved false narrative that the network has repeatedly aired about the Flight 800 crash. Indeed, Kaye’s package follows what seems to be CNN’s standard operating procedure when producing these official line reminders embedded in reports on other crashes. The embedded reminders typically bear these hallmarks: official sources making false declarative statements about no missile evidence; narration or an official source discrediting the eyewitnesses, either via a sweeping declarative statement or with inaccurate information; at least one mention of the term “conspiracy theory” when missiles are discussed. Kaye’s package has all the aforementioned hallmarks and is a fitting addition to CNN’s fat dossier of inaccurate reporting on the TWA Flight 800 story. “The FBI and NTSB, looked at every possibility, a missile, a bomb, terrorism….”, Kaye narrates. This sweeping statement is inaccurate. The FBI and NTSB did not look at every possibility, particularly the physical evidence indicating that one or more proximity- fused missiles downed Flight 800. Not only have CNN reporters and producers been made aware of this, the radar evidence and eyewitness accounts supporting a proximity fused missile hit have been sent to them and many other members of the press. Kaye then brings on former NTSB Board Member John Goglia who says, “I spent hours and days looking at every piece of metal, looking for the telltale signs of a missile and there were none.” Mr. Goglia’s sweeping comment is so patently absurd that one wonders why Kaye would put it in her report. Besides the obvious impossibility that Mr. Goglia singlehandedly performed such a herculean task, the fact is that as an NTSB board member at the time, he was not even an active participant in the investigation. In fact, Mr. Goglia was never an investigator for the Flight 800 crash or the NTSB. According to retired senior NTSB investigator Hank Hughes, who was assigned to reconstruct TWA 800’s interior using recovered wreckage, Mr. Goglia’s duties as a board member at the time were to review final reports and opinions as well as orders written by the NTSB’s administrative law judges. Mr. Goglia then voted on these matters with other board members. As an official source talking to the press about the Flight 800 crash, Mr. Goglia has consistently hewn to an official narrative that the physical evidence shows is untenable. Ms. Kaye should have asked Mr. Goglia what role he actually played in the NTSB investigation, how it was possible for him to inspect every “piece of metal”, what expertise he had in missile types and their telltale signatures, and if he looked for telltale signatures of anything other than shoulder-fired missiles, because there is no record of it among the NTSB’s documents. She should also have asked him about the radar evidence consistent with an ordnance explosion in Flight 800’s vicinity right when the jetliner lost electrical power. Besides his comments to Kaye, Goglia has provided a great deal more inaccurate information to the press on the Flight 800 crash investigation. A good example is a film review for Forbes magazine that Goglia wrote about the documentary “TWA Flight 800”. The film features six whistleblowers who were key members of the official TWA Flight 800 crash investigation. A fact-check of Mr. Goglia’s review can be seen here. In her piece, Ms. Kaye narrates the hallmark moment for discrediting TWA 800 crash eyewitnesses. “No matter what witnesses thought they saw,” she declares, “the government says there was simply no proof of a criminal act.” After implying that Flight 800 eyewitnesses were victims of mass misperception, Kaye reports what the government says without any qualifiers at all, including the fact that key members of the official investigation into the Flight 800 crash have publicly presented physical evidence indicating that an ordnance explosion caused the jetliner’s demise and that this evidence does raise questions about an act of some kind—criminal or accidental—bringing down the plane instead of the mechanical malfunction that the NTSB said was the probable cause of the crash. In fact, there is no hard evidence of a center fuel tank explosion triggered by a short circuit, which is what the NTSB said probably caused Flight 800’s demise. Here Kaye finally makes her first effort to justify the title of the news package and draw a comparison between the Metrojet and Flight 800 crashes. Obviously both jetliners succumbed to “a catastrophic in-flight event”. But then Kaye veers back into misreporting and discredits the eyewitnesses once more when she narrates that a “heat flash detected at the time of the Russian jet crash” is “similar to the red flash” people witnessed when TWA crashed which turned out to be “the plane already on fire…”. Kaye does not say that any eyewitnesses reported seeing a “red flash”, she simply declares it without attribution and then further declares that the red flash was burning wreckage falling to the sea. Kaye’s statement ignores and therefore draws attention away from what dozens of eyewitnesses saw before any burning wreckage started falling to the sea. These eyewitnesses reported seeing a “white light shoot up in the sky,” a “flash and object then rising” a “rocket went up in the air” a “red streak,” a “firework ascending,” a “streak of light heading up towards the sky,” and numerous other similar descriptions. Kaye’s red flash/burning wreckage statement discrediting eyewitnesses who saw objects rising to meet Flight 800 before it exploded echoes the contents of an animation video analyzing Flight 800 eyewitness accounts that the CIA’s Randy Tauss produced with a team of analysts. Tauss and his team aimed to show that none of the eyewitnesses had seen a missile. They did this via a sin-of-omission sound propagation analysis. The analysis was based on eyewitnesses who looked up when they heard something, which conveniently eliminated the key eyewitnesses who saw objects going up in the sky long before they heard any sounds or explosions. 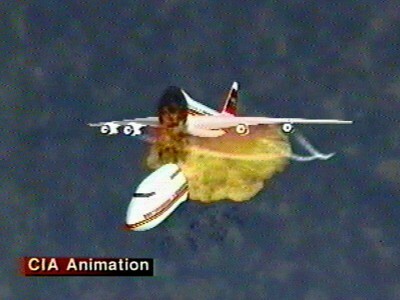 The big deception in the CIA team’s animation is that even though their sound propagation analysis eliminated the eyewitnesses who mattered the most— those who saw the very first stages—things going up to meet the plane–of Flight 800’s demise, their conclusion includes and discredits these very same eyewitnesses. The animation contains so many critical inaccuracies that one can only conclude that discrediting this sizeable group of key eyewitnesses was, in fact, its sole purpose. Thanks to Kaye and others, its purpose continues to be served. A point-by-point rebuttal of the CIA animation can be seen here. Clearly Metrojet’s initiating event is not at all similar to TWA’s because in the case of TWA, eyewitnesses reporting seeing objects rise off the earth’s surface to meet TWA before it exploded. Kaye’s statement about a red flash actually being falling wreckage appears to be an abbreviated—and wholly false—riff on the CIA’s thoroughly discredited animation video. By billing Kaye as an investigative reporter for Anderson 360, CNN conveys to its audience that she has the skills and experience to properly vet sources and information. In the case of “How is Metrojet Crash Like TWA 800”, Kaye has fallen far short of meeting even minimum reporting standards. This news package joins the work of others at CNN who for twenty years now have persisted in misreporting and unquestioningly using official sources who consistently provide misinformation about the TWA Flight 800 crash case. Anderson Cooper mentioning Flight 800 being “shot down off the coast of Long Island of New York” while reporting on the crash of Malaysia flight MH17 was the one brief moment that a CNN correspondent actually told the truth about this case. But Cooper’s momentary departure from the false narrative could not stand. He corrected himself immediately and fell back in line. Two decades of reporters at CNN and other major news outlets consistently failing to do even the most basic journalistic due diligence on this story amounts to a kind of group pathology. Whether it is willful ignorance or outright corruption or both, it is profoundly disturbing, particularly since it has been going on for so long. Kristina Borjesson is an investigative journalist and media critic. She edited the landmark media criticism book, INTO THE BUZZSAW: Leading Journalists Expose the Myth of a Free Pressand, as a network producer, won Emmy and Murrow awards for her investigative reporting. More recently, she independently produced and directed for the Epix premium cable channel the documentary, “TWA Flight 800”. The film features six whistleblowers who were key members of the official Flight 800 crash investigation.